In a surfcourse the main emphasis is to spend time as much as you can with your family. With that we teach the whole family in our camp. In groups of max. 8 people 1 – 3 families have the opportunity to get a lesson. This group size guarantees not only enough safety in the water but also the surfinstructor can pay attention to each student to coach his or her surfing in a way. Every day you get max. 4 hours of schooling which have a short break where young and old can get energy. we have made the experience that it is not practical to teach more than 4 hours a day. the body gets complety exhausted and you do not have any more power. So the lessons are not fun for you! In addition to the practical training you also get some theory lessons where not only the kids can learn about the development of waves, the ocean and the equipment e.g. We teach with high quality equipment. You can get boards in all sizes and shapes: softtops, hardsboards, longboards, magnums, malibus, minimalibus, shortboards and fishes. So Mum, Dad and the kids can jump into the wetsuits, which keep you warm during the lessons, and spend an awesome surf trip. 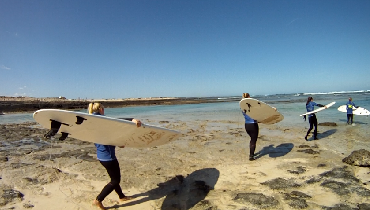 We teach on different surfspots – not only on the beaches in Corralejo. With that we drive to other beaches and reefs in Fuerteventura – depending on the conditions. We offer you the best waves every day and you will never get bored! No matter if beginner, intermediate or advanced, we offer surf lessons for families for every level. The BEGINNER COURSE is for all the people who have never stood on a surfboards before. We want you to stay on a surfboard very quick, that you get familiar with wave and ocean and that you feel comfortable and save. In the INTERMEDIATE COURSE we teach people who have already made experiences with board and wave. We want to ride the first green waves with you and maybe show you how to do turns. 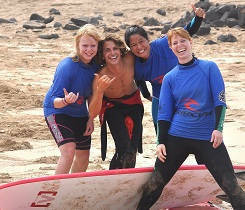 All our surfinstructors are very skilled surfers, have appropriate advices and help you that you reach the next level. In our ADVANCED SURFCOURSE we teach surfers who are able to surf green waves and feel comfortable in waves of 1.50m height. We go surfing with you, try to correct mistakes and give you useful advices to get the finishing touch. Surf lessons for families from Planet Surf – you’ve come just to the right surf camp in Fuerteventura!